Alexandria, Egypt. July 1942. 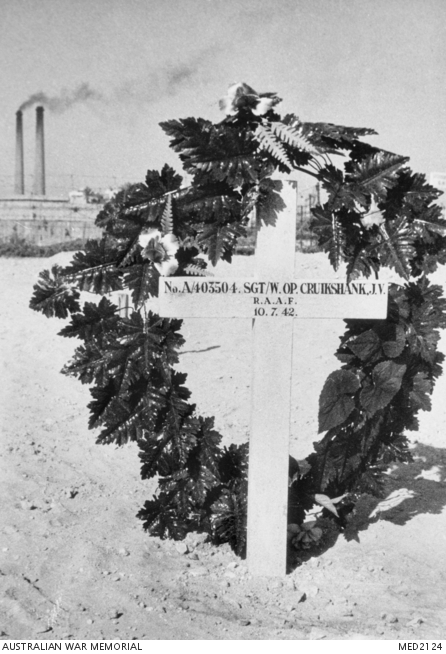 A cross and wreath mark the grave in the Alexandria (Hadra) War Memorial Cemetery, Plot 3, Row B, Grave 1, of 403504 Sergeant John Vincent Cruikshank, RAAF Wireless Operator, of No. 459 Squadron RAAF, who died 10 July 1942. He was the son of Sydney Herbert and Ann Alexander Cruikshank of Leichhardt, NSW. Hadra is a district on the eastern side of Alexandria.